This set includes two 12" cotton padded clothes hangers placed inside a white sheer bag tied shut by white ribbon. 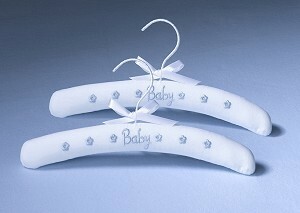 The word "Baby" and a series of flowers are embroidered in blue on one side of the hanger. This set includes two 12" cotton padded clothes hangers placed inside a white sheer bag tied shut by white ribbon. The word "Baby" and a series of flowers are embroidered in blue on one side of the hanger. Ideal baby shower or new baby gift. Also ideal for gift baskets, christening and naming celebration gifts.